Today I’m so excited to share with you a travel hack that I’ve learned/perfected over our past two trips to Europe. 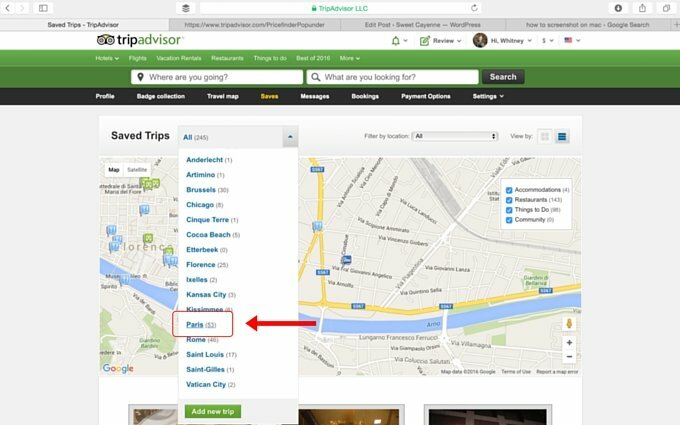 Did you know that Trip Advisor has a free navigation feature that you can use without a Wifi connection??? 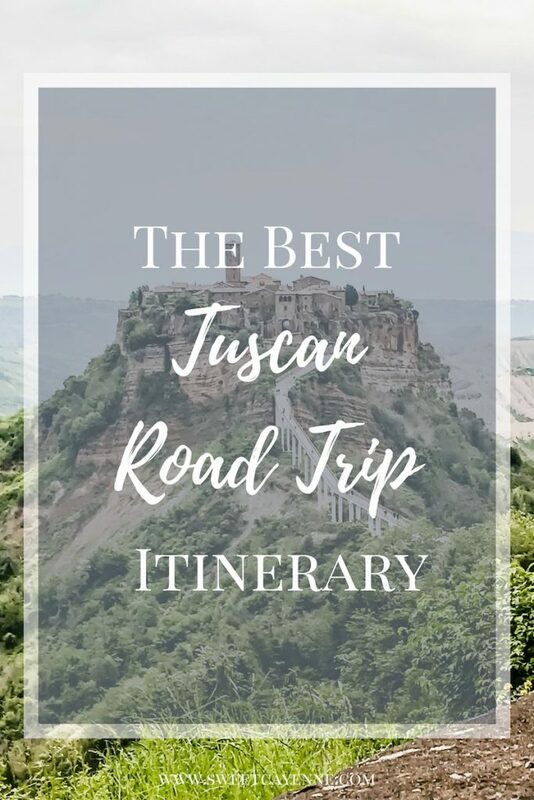 Yeppers, it sure does – and it’s a game changer when it comes to finding your way around a city and making sure you get to everywhere on your trip itinerary. 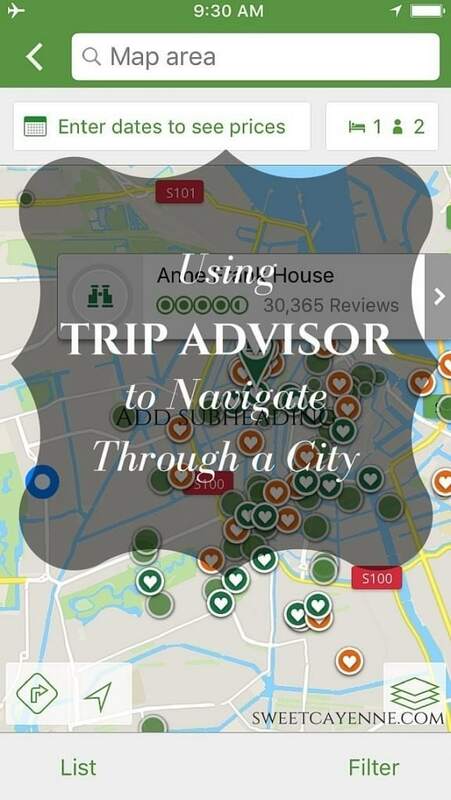 Even if you’re not into reading Trip Advisor reviews, the way I’ve learned to use this app has been a life saver for Ryan and I – I hope it helps all of you travel lovers as well! Read on for my step-by-step tips on this amazing travel hack. 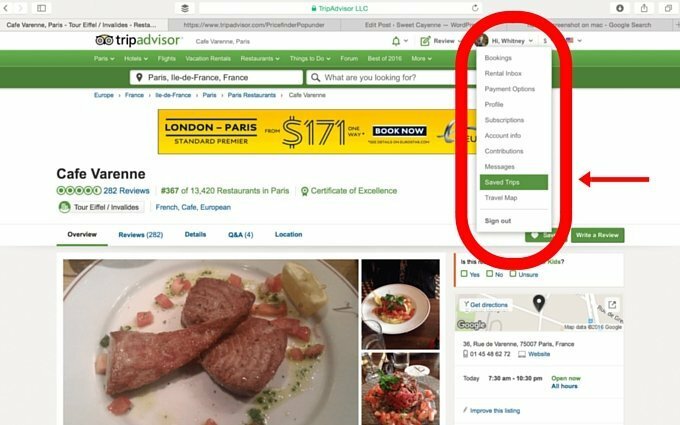 Create a Trip Advisor Account. This is absolutely necessary for using the navigation feature the way I’m about to show you. You can certainly opt out of any e-mail communication, which in my opinion, is always a good thing. 2. Search for places you’d like to go, and then “save” them to a trip. Once you find the place you are searching for, click the heart “save” icon to save it to your list of places you’d like to visit in a city. After you’ve searched for and “saved” all of the places you’d like to visit in a particular city, click “saved trips” under your name and profile icon to view all of the saves on a map of a particular city. Once you click on “saved trips,” click the drop down menu (pictured below) to find the city you are interested in viewing all the saved locations for. We will continue to use Paris for this example. 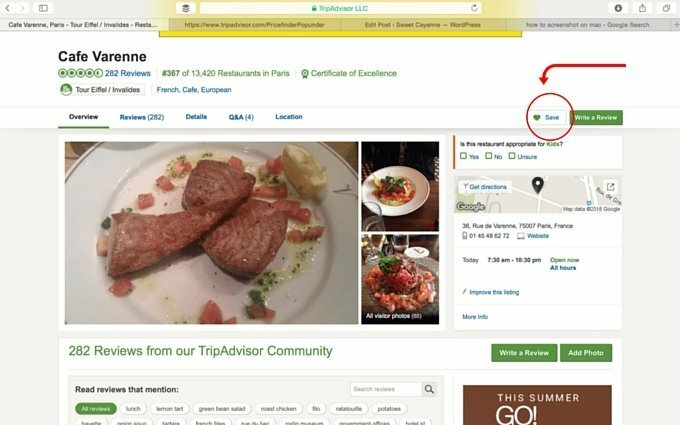 Once I’ve selected “Paris” as my city, I will see a map with all of the places I’ve saved on it – “things to do” are the green binocular icons and restaurants are the blue knife and fork icons. As you’ll see below, Cafe Varenne shows up on my Paris map as a saved restaurant. 3. Download the Trip Advisor mobile app. Do this once you’ve used a desktop/laptop to search/save everywhere you’d like to visit in a city – trust me, it’s much easier to do all of that on a bigger screen! 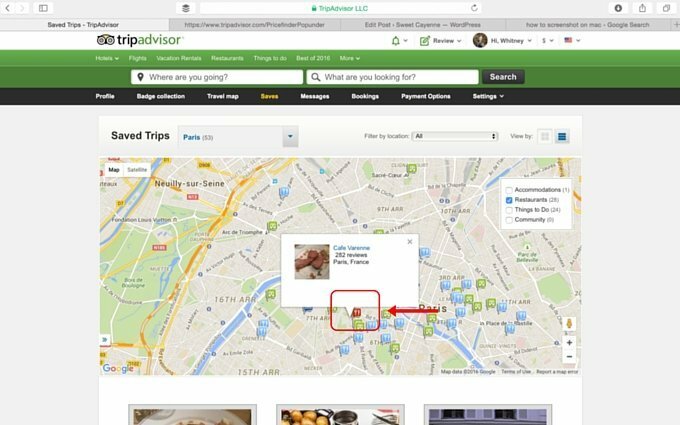 You will use your Trip Advisor account login information on the app to view all of your saved information. 4. Using the Trip Advisor mobile app, download the offline map for the city you will be visiting. 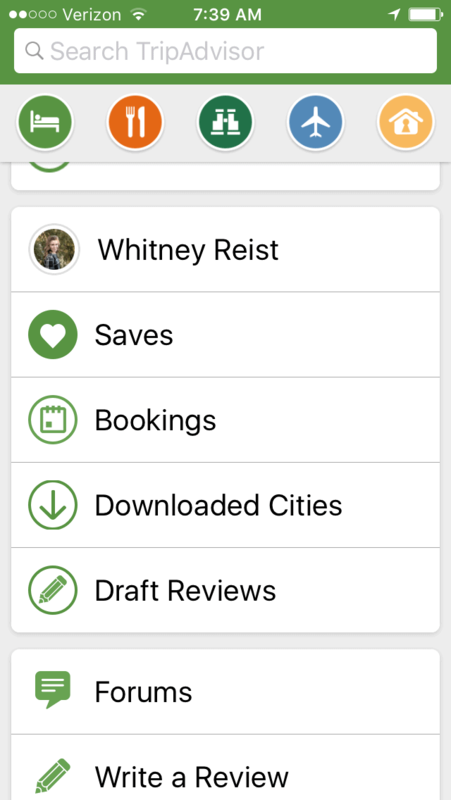 When you open the Trip Advisor mobile app, scroll down a ways until you see “downloaded cities.” Click this and then type the name of the city you’d like a map for in the search bar. In the screenshot below, you will see all of the cities I have downloaded maps for and the size of data space they take up (be sure to delete any city maps you aren’t using because they take up a lot of space!). Next, click on the city map you would like to use. By clicking on the map icon shown in the above photo, you will be able to see the downloaded city map along with all of the locations you originally searched for and saved on the Trip Advisor website. You will be able to see all of your “saves” on the map with or without a Wifi connection! Restaurants are represented on the map with orange hearts and things to do are represented with green hearts. If you hover over a heart with your mouse pad or place your finger on it with your phone, you will be able to see what location the heart represents on the map. Scroll in on the map to see street names around your location and so forth. As you will notice below, I have scrolled all the way in to view the area around my saved location of the Musee Rodin (Rodin Museum) in Paris. Here’s a very specific trick that I learned by trial and error recently: if you plan to use public subway/metro transportation to get around a particular city, you can make note of the metro station closest to your desired destination on the downloaded map when you are connected to Wifi. 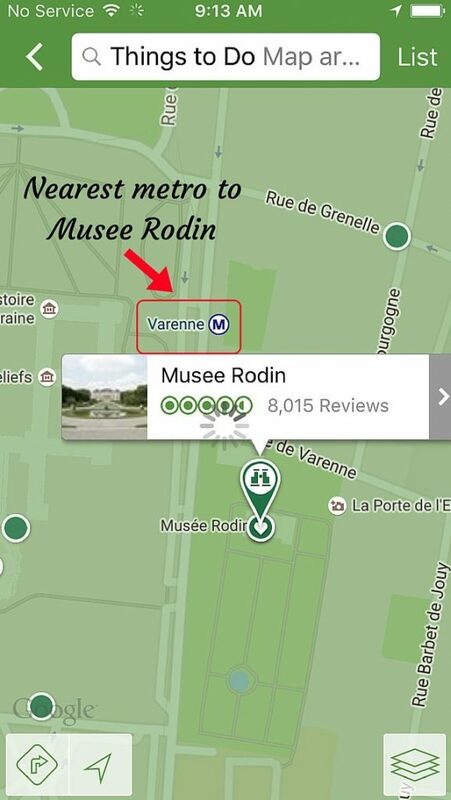 In the example below, you can see that the nearest metro station to Musee Rodin is the Varenne metro station. Note that metro station icons will only show up on your map if you are viewing it with a Wifi connection. Simply take a screenshot like the one below to save the locations of metro stops near places you’d like to visit on your phone – that way you’ll know exactly where you need to stop when using the public transportation! This is where the navigation feature of Trip Advisor comes into play. When you are out and about in a city and do not have a Wifi connection, you can use your downloaded maps offline to help you navigate your way to a location that you’ve saved. In the example below, I’ve got my phone in airplane mode (so as not to be charged for roaming). 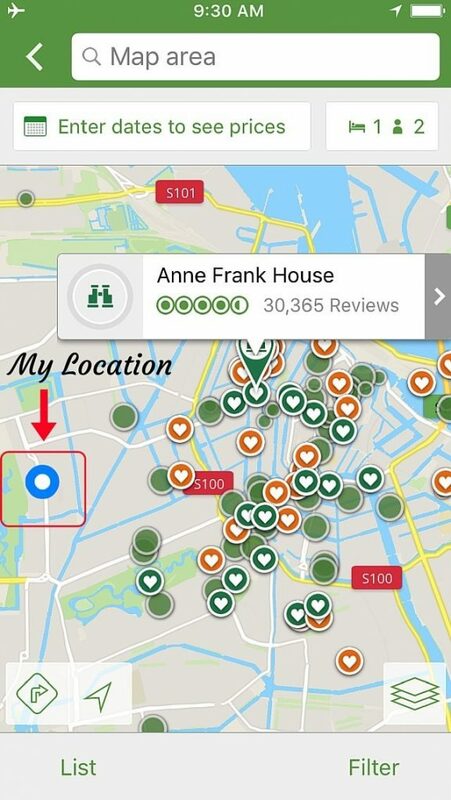 I’ve opened up my city map for Amsterdam in Trip Advisor so that I can make my way to the saved location of the Anne Frank House. You’ll see below that my location is represented by a blue and white dot. If I scroll in, I can see the exact street that I am on. The blue and white dot will move on the map wherever you move, so all you need to do to navigate your way around is follow the blue and white dot to a specific location on the map. Another insider tip: your offline map will also populate things to do, restaurants, and hotels that you haven’t saved. These are represented by solid green and orange circles, as you can see below. And there you have it! I hope this tutorial is helpful for all you travelers out there – it’s my favorite thing to use when traveling to cities in the US or abroad. Since we are talking all about travel, have you ever used Airbnb? Ryan and I use Airbnb all the time when we travel in the states and overseas. We find that you are able to get more privacy and pay less for it when you use Airbnb. Win and win in my book! If you sign up for Airbnb through our link, you will get $40 off your first stay. 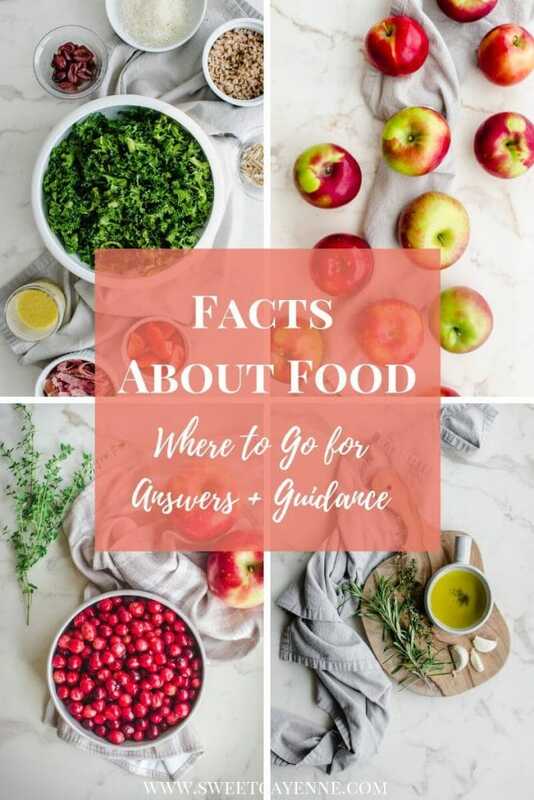 Be sure to share this post with anyone you know who may find it helpful – happy travels! For other travel related posts, see – 48 Hour Travel Guide to Bangkok, Packing Essentials – 10 Days in Europe, 72 Hours in Amsterdam, or Something fun to do around Nashville at Mammoth Cave. Sign up for to receive more travel info and other exclusive (subscribers only) info and freebies. To start off, you will get a free cookbook after signing up. 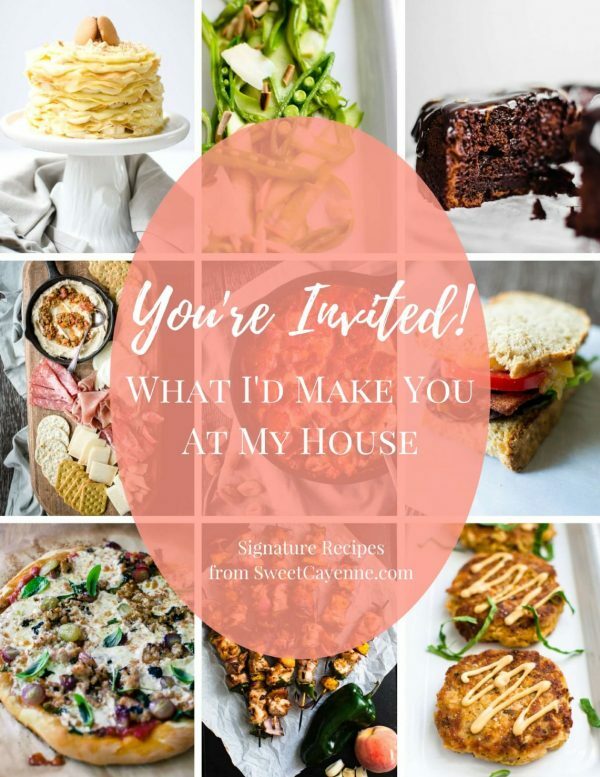 If you hang around my site long enough, you will see that most of what I do is post recipes; however, lifestyle, travel, and beauty posts are becoming more frequent. You can follow me on Instagram or Twitter with the tag @sweetcayenne5 – I’d also love to feature your travel photos in my monthly newsletter, so you can upload a photo and be sure to tag me. Happy Travels! Great article! I actually knew MOST of this information and plan on using the offline maps to view my saved places on my next trip. However, I did not know that my location could be tracked while in airplane mode?! I assume location services needs to be turned on for TripAdvisor in order to do this?! GREAT TIP. This will be helpful in getting me from wherever I am to the places I want to get to! Fantastic! Hi Julie! Yes – I was surprised to learn about the location feature as well. It’s true – as long as you have location services turned on, you will be able to see your location and follow the blue dot from point to point in airplane mode. It’s great! Everything you need for getting around in one app 🙂 Happy and safe travels to you!